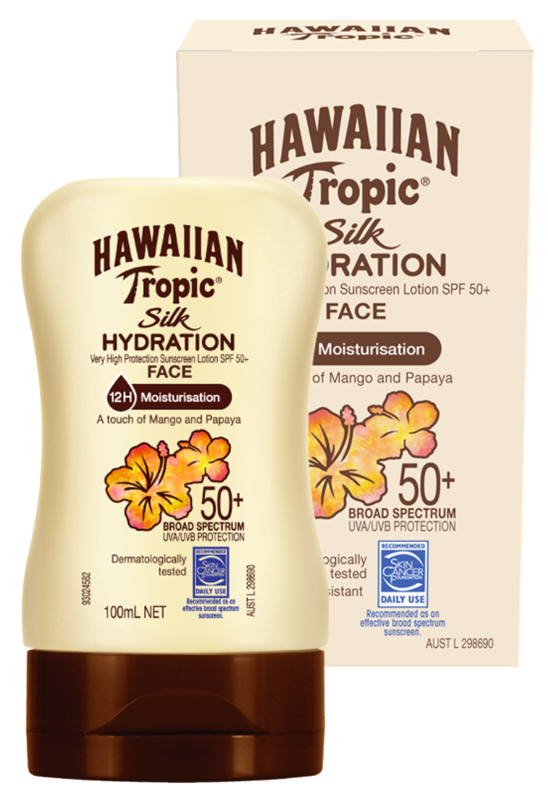 NEW Hawaiian Tropic® Silk Hydration Face Lotion SPF50+ combines a very high protection with a hydrating formula to wrap your skin in 12 hours of continuous moisture. The oil free, fast absorbing formulate provides a silky, non-greasy skin feel for your face. Contains active ingredient(s): Homosalate 10.00% w/w, Octocrylene 6.00% w/w, Butyl Methoxydibenzoylmethane 3.00% w/w. Preservative(s): Phenoxyethanol, Chlorphenesin. Contain(s): Benzyl Alcohol 0.5% w/w. Benzoates.